A hot air balloon flight is the ultimate experience of a lifetime. The beautiful locations that can be viewed from the sky are unforgettable, especially over England, Scotland and Wales. These locations offer a great deal of fun to people from all walks of life. Corporate people go for hot air balloon rides along with their team members usually as a team building activity or corporate “thank you” present / reward. 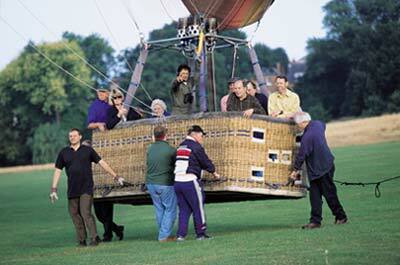 Corporate balloon flights are something employed by companies to give their members a respite and a break. Corporate people usually book these flights as part of building their team, to help them come closer to each other and also to discuss corporate matters in a light and engaging manner. When together, the members of the company share and enjoy naturally. Corporate companies also choose to advertise on hot air balloons by having the logo of their company on the balloon or a banner around the balloon basket, advertising the company. Hot air balloon flights are a thrilling experience in peaceful serenity. This can be a perfect advertising opportunity if conducted correctly and if the right aerial advertiser is employed. Aerosaurus Balloons have a wealth of over 20 years promoting brands and companies in the sky, having worked with big names such as Ford Motor Cars and Morgan & Stanley. As for team building events, the team will collectively have a wonderful experience on the day either just on a balloon ride or, at request, we will organise a whole day of events based around ballooning which will focus on team work, delegation of jobs and equal opportunity. The world can be experienced from a different perspective with the help of Aerosaurus Balloons’ expertise of team building, and providing experiences, all you have to do is see our passenger feedback to find out for yourself how happy our passengers are. To find out more about corporate balloon rides please contact Aerosaurus Balloons on 01404 823102 to find out more.